I've been a gamer all my life. During my childhood I never actually owned a game console until the Gameboy Advance was released in 2001, but before that I would play on my brothers' Mega Drive and Gameboy. Up until I owned the GBA, and even for a while after it, my childhood was spent playing classics (to me at least) such as Puggsy, Wiz 'n Liz, Jungle Strike and Micro Machines 96 on the Mega Drive, and Tetris and Pokemon Yellow on the Gameboy. I wasn't entirely antisocial just to be clear, I did frequently explore my neighbourhood and engage in recreational activities such as biking and football, the usual for every kid. To be honest, I was a pretty bad gamer as a child, I couldn't even get past the first gym on Pokemon for months, but ignorance is bliss and I had a pretty damn good childhood, a perfect blend of family, friends, Lego, outdoors and video games; the ideal recipe for any child to enjoy their childhood. At this age I only listened to Linkin Park and overall music wasn't a huge part of my life (yet). This was a pretty tense game for me as a child, and it took me months to realize that the 4x1 piece was far more useful upright. 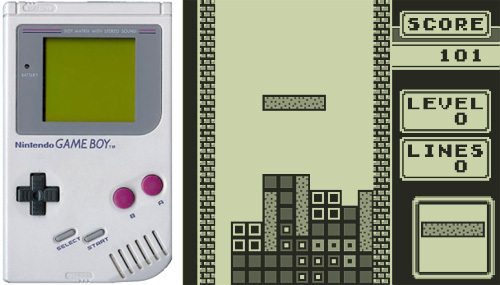 The first game I ever played was most likely Tetris on the Gameboy. Despite being a puzzle game and being a typical boy who should only be interested in action packed and over the top...well anything really, I somehow enjoyed Tetris and became rather adept at it. Pokemon Yellow was the first game I ever personally owned (and not belonging to my brothers') and I still own the cartridge today and enjoy the series now; a true monument to how such a simple premise for a game can be so successful for generations. I did play PC games as a child, although these weren't typical PC games, some being ports of Mega Drive games. I did own Worms 2 though, and thoroughly enjoyed this, despite being absolutely horrible at strategy games (I still am now; although can strangely enough co-ordinate rather complex strategies on competitive FPS's). The first console I ever owned (excluding handhelds) was the Xbox; coming rather late into my life (2004), and as a result me missing out on an entire generation of games (The PS1/Dreamcast era) and a large portion of the preceding gen. This portion of my life is where I truly developed my passion for gaming and music, (I'd always been a frequent sketcher throughout my childhood though) with music being a minimal part of my life prior, and gaming just being a pass-time. For the majority of my teenage free time I would either be drawing, learning guitar, or playing games, all of which I am now pretty proficient at; and after the hours I've put into all of them, I should hope so. Halo. No doubt from my previous blog entries you should know by now Halo is a huge game in my life. I bought Halo CE about a month after getting an Xbox for Christmas as an impulse buy in Blockbusters, and then Halo 2 pretty much as soon as I had finished it. The sole reason I bought a Xbox 360 was to play Halo 3 as soon as I could just to finish the epic storyline (having read the canon-expanding books prior to it). I owned many games on the Xbox prior to getting a 360, mainly FPS's, as these (to me) were at their peak; very original games that were very distinct from one another and all offered different ways to play; games with unique art styles such as XIII and games that were highly under-rated, such as Urban Chaos: Riot Response. I also owned many action-adventure games such as the Prince of Persia series and the infamous Ninja Gaiden; a game I felt extreme satisfaction for completing even on the easiest difficulty. Games such as Prince of Persia and Halo showed to me how gaming was home to very immersive stories and fantastic storytelling, slowly catching up to the likes of Hollywood Blockbusters, despite being only one foot into mainstream at this point in time. For the latter half of my teenage gaming years (from around Year 10-the end of Sixth Form), I spent the majority of my time playing my Xbox 360 and guitar, with my drawing being mostly school time and art lessons. This was the point where I developed a rather unhealthy addiction to Halo 3; I would almost ignore all my other games, and play Halo every night for hours on end. In the time span that game had, up until the server shift to Halo: Reach which ultimately ruined Halo 3's online connection during games, I clocked up an unfathomable amount of hours playing online and custom games with my friends. The Halo 'forging' community were incredibly ingenious, creating game-types and maps that me and my friends would play almost every night. I took to the competitive side of it as well, so when we weren't having fun a few select friends and me (not all of my friends enjoyed it competitively) played ranked matches more seriously, formulating surprisingly in-depth and effective strategies for every single map; and provided we were all listening and aiding one another, we would almost always win; unless we met a team with greater skill and co-ordination than us. There's nothing quite as satisfying in gaming triumphing over a evidently better team than you due to better teamwork, then both sides claiming it as a 'good game' in the post-game lobby. Although this fun and competitiveness wasn't without side effects of course; I was quite prone to bouts of rage upon losing, as any teenage boy would be when being seemingly bested at his favourite online game (an issue I have now dealt with, now I take a much more calm approach to it). With such rage my dad would often come upstairs, having been put in a mood by my tantrums, and then I would be angered more by his involvement, which always went through the same argument of me 'never going outside' and how I'll grow up and 'think of how I wasted my teenage years', but this has since passed and the arguments are long gone thankfully. To be honest, I look back on the sheer time I spent on Halo 3 and already miss it; everything's changed since then and people have moved on, and no game since has bested it in terms of sheer longevity and personal enjoyment, all thanks to being able to enjoy it with my friends. It's not like I wasted my years as a teen; I had a great time at school and made some awesome friends, some of whom happened to play Xbox online with me, some who didn't, and even made some friends over Xbox Live, one of whom is now one of my best friends. It's weird to think that I know him as well as my best friends with whom I physically interact with, despite having never actually met him; a true example of how technology has brought people closer together (and physical social interaction apart *cough* Facebook *cough*). How can you not want to play a game with a title card as imposing as this? Alongside playing Halo, I also played many other blockbuster releases, and some games that under-performed at retail; such as Mirror's Edge and Alan Wake; two of my favourite games that barely anyone else actually played. I play games mostly now for their stories and overall gameplay; graphics, multiplayer, extra features etc etc. are just bonuses to me, although I do have a tendancy to be an 'Achievement Whore' where I try to obtain 1000 Gamerscore on every game I've owned for the 360. This isn't so much for bragging rights, but more for personal challenge and the satisfaction of that final 'bleep bloop' when I unlock the final achievement. An example of my commitment would be when I was going for all Gold Medals on Portal challenges, an extremely hard task, when my Xbox decided to delete my data when I was around 85% complete for the achievement, at 2 in the morning. I stayed up until 6am redoing every single challenge, and perfecting every single room to get those Gold Medals and obtain that final achievement. During my teenage years my handheld gaming passion died down considerably, now I only really play the new Pokemon games when they are released, as there is just an unshakable charm from them that I can't seem to resist. This song here basically describes how I felt during my summer of 2009, when I'd just finished my GCSE's and was awaiting results to get into 6th Form. I spent the entire 3 or so months doing nothing but having late nights and spending the day either swimming or out and about; with the occasional camp trip nestled in there, and finishing the day off with some competitive Halo matches. It was by far the greatest summer I have ever had as of yet and will most likely remain that way forever. I even threw in a 6 person LAN party in there for 3 days straight for good measure.